This time each student received only a book. The printed material has A4 format and is less handy (in my opinion) in comparison to materials provided on other Spring courses. I participated previously in Spring Core and Spring Enterprise courses. Those times the book format was smaller and there were delivered USB drive with e-version, a notebook to write in and a pen. This time the couch shared e-version of materials to allows us transferring data into our machines. I definitely prefer the approach which was in the past. The course covers technologies and tools which Pivotal preferes and offers at this moment. We can find here e.g. Apache Tiles, JSP in building web applications. There are also new things e.g. WebSockets and Spring Boot. There is provided the full stack of involved technologies. Probably not all of these components you’ll need to develop your web applications. The exact scope can be found on  and . I was on the latest training edition and the scope differs from the official. There is no longer Spring Webflow whereas there are Spring Boot and WebSockets. Taking part in this course is the only way to get an exam voucher and finally take the exam. If you’re interested in Spring Web area and want to be certified then you can consider this workshop. 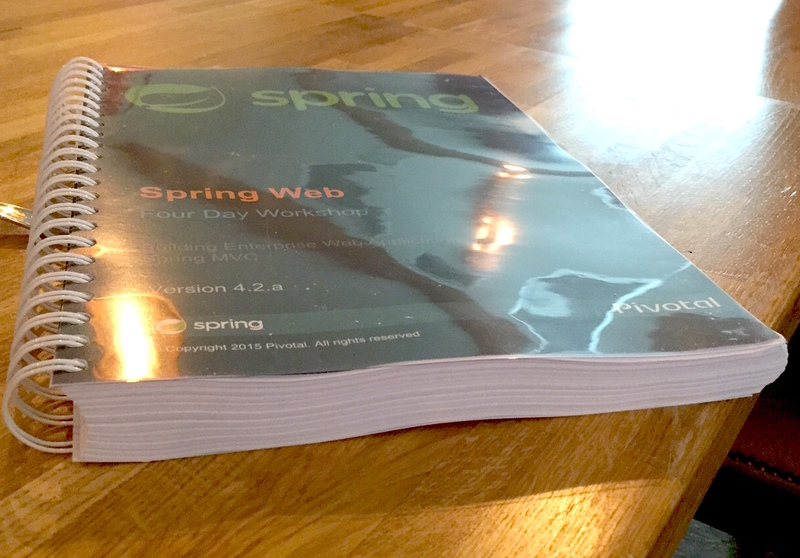 In general I recommend this course because it covers quite deeply the full web (spring) stack. Completing this course and studying theory and labs is a preferred approach to pass the exam. Printed materials are the base to learn. Manuals and 3rd party books can be sometimes a good addition.